Early Literacy Aside--Example: This book is full of interesting words that we might not use in regular conversation with our babies and toddlers. Sharing this book with our children offers us the opportunity to build their vocabulary as they hear new words and their listening skills as they become aware of words that sound like the sounds themselves. When we expose our children to new words, even if they don't understand all the words right now, we build their vocabulary which makes it easier for them to understand words later and to understand what they will read. When we point out sounds, we help them become more aware of the sounds around them. This awareness can also help them later hear smaller sounds in words which will help them later sound out words when they learn to read. Early Literacy Aside: Adults, this book has many interesting words your children may not know yet, such as a bird's plumage, or the alligator is submerged. When we use these unfamiliar words with children and then give a brief explanation, that is how they learn new words which will later also help them understand what they read! Read the book, offering synonyms for a couple of words. Early Literacy Aside--Example: Adults, in our next book, notice the many ways to say the same thing, so many different expressions. Talking about the different meanings of words helps to build your children's vocabulary which will later help them understand what they read. Early Literacy Aside--Empower: Adults, this week you may like to think about some of the expressions you use, and talk about words with different meanings. I have a handout with some more idioms. Early Literacy Aside--Explain: Today I'll be pointing out we can share feelings while using books and songs. It is important to use many different words for feelings. This not only helps your child learn new words and builds their vocabulary, but it also helps them manage their feelings. The first step to managing feelings is to able to identify feelings. Book: Read Look at You! Talk about the expressions on the faces of the children in the photos. For some, you may ask them to make the faces of those feelings. Older children will be able to remember a time they felt that way. Early Literacy Aside--Example: As we shared this book, some of the children shared when they have felt upset or surprised, which helps them understand these feeling words and their own feelings more deeply. Using specific words for feelings helps develop your children's vocabulary. Early Literacy Aside--Empower: There are many books that lend themselves to talking about feelings. Sometimes you may talk about feelings from the expression on a character's face in a picture, even if the feeling word is not mentioned in the text. When you read with your child, your child can share more than in a storytime group. I hope this week you will enjoy sharing feelings as you read together. I have a list of some feeling words to give you, to help bring them to mind. Sometimes it is hard to think of words for our feelings, other than the obvious ones like happy, sad, angry, surprised. Introduction: Our next book is about a crocodile who is trying to have some fun and in the process is stirring up a big ruckus!Early Literacy Aside--Example: Adults, listen to the many interesting words that children may not hear in everyday conversation. You'll see that I will actually talk about a couple of the words. This is a good way to build your children's vocabulary in a gentle way. Early Literacy Aside--Empower: Children learn through repetition. So, reading a story such as Solomon Crocodile over several days or weeks will help them understand the story better. They may become so familiar with it that they join in with the words in the book. And you may find that they use some of those interesting words in other situations. You can too. The best way to learn new words is not from lists of words with definitions, but from using the words in different situations when appropriate. 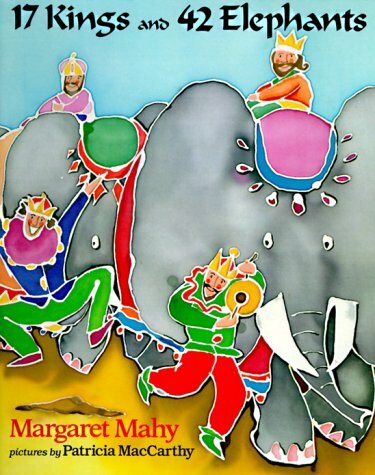 Introduction: Our next book is 17 Kings and 42 Elephants written by Margaret Mahy and illustrated by Patricia MacCarthy. Now we will take a journey into the jungle without even leaving the story room. In this story there are some nonsense words—that means they are not real words, but are made-up words. Listen carefully to try to figure out which are the nonsense words, but don’t tell. Read the book. Go through the book and tell which are the nonsense words. Ask the children what they think a couple of the nonsense words might mean. Talk about one of the real words and its meaning. Extension Activity: Elmer PuppetHand out elephant cut outs on white card stock and colorful construction paper squares to glue to the elephant or crayons to color the elephant. They then glue a popsicle stick to the back. Encourage children to describe what they made and to retell the story using their puppet. Adults with babies can make a colorful elephant to move in front of their babies’ eyes and talk about the shapes and colors. Early Literacy Aside--Empower: Adults as you play with your children or make crafts with them, try to use a word they are less familiar with. Children learn words best through their experiences, not by memorizing words. You might use less familiar words for colors, like fuschia or magenta, or perhaps the way the elephant is walking, lumbering slowly along. You have many opportunities throughout the day to build your children’s vocabulary. It is these little things you do over and over again that make a difference. We sing this song after reading Wolf's Chicken Stew by Keiko Kasza. The first time you come to the word scrumptious, add the words delicious or yummy. [If you prefer you can tlak about the word scrumptious before starting the book. ]Early Literacy Aside--Example: When a book has a word that is unfamiliar to your child, this is a great opportunity to build vocabulary. Don't replace the word with a simpler one, just explain it briefly. Books have rich language, more unusual words than we use in daily conversation. Five Scrumptious Cookies Five scrumptious cookies in the baker’s shop Big and round with some sugar on top Along came a boy with a penny to pay Who bought a scrumptious cookie and took it away. Four scrumptious cookies . . . Three scrumptious cookies . . . Two scrumptious cookies . . . One scrumptious cookie . . . No scrumptious cookies . . . Big and round with some sugar on top No one came with a penny to pay. So close the baker’s shop and have a baking day. Sing songs in English and in at least one other language during storytime.Early Literacy Aside--Empower: Adults, you can sing anywhere about anything in any language! Singing helps children hear the smaller sounds in words to help them sound out words later. Also many songs have new words for them to learn which will help them know the meanings of words when they get to school.